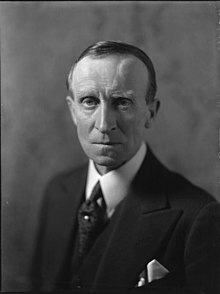 John Buchan, 1st Baron Tweedsmuir, GCMG, GCVO, CH, PC (/ˈbʌxən/; 26 August 1875 – 11 February 1940) was a Scottish novelist, historian, and Unionist politician who served as Governor General of Canada, the 15th since Canadian Confederation. Buchan attended Hutchesons' Grammar School and was awarded a scholarship to the University of Glasgow at age 17, where he studied classics, wrote poetry, and became a published author. He moved on to study Literae Humaniores (the Classics) at Brasenose College, Oxford with a junior William Hulme scholarship in 1895, where his friends included Hilaire Belloc, Raymond Asquith, and Aubrey Herbert. Buchan won the Stanhope essay prize in 1897 and the Newdigate Prize for poetry the following year; he also was elected as the president of the Oxford Union and had six of his works published. Buchan had his first portrait painted in 1900 by a young Sholto Johnstone Douglas at around the time of his graduation from Oxford. Buchan entered into a career in diplomacy and government after graduating from Oxford, becoming in 1901 the private secretary to Alfred Milner, who was then the High Commissioner for Southern Africa, Governor of Cape Colony, and colonial administrator of Transvaal and the Orange Free State, putting Buchan in what came to be known as Milner's Kindergarten. He also gained an acquaintance with a country that would feature prominently in his writing, which he resumed upon his return to London, at the same time entering into a partnership in the Thomas Nelson & Son publishing company and becoming editor of The Spectator. Buchan also read for and was called to the bar in the same year, though he did not practise as a lawyer, and on 15 July 1907 married Susan Charlotte Grosvenor—daughter of Norman Grosvenor and a cousin of the Duke of Westminster. Together, Buchan and his wife had four children, Alice, John, William, and Alastair, two of whom would spend most of their lives in Canada. In 1910, Buchan wrote Prester John, the first of his adventure novels, set in South Africa, and the following year he suffered from duodenal ulcers, a condition that later afflicted one of his fictional characters. At the same time, Buchan ventured into the political arena, and was adopted as Unionist candidate in March 1911 for the Borders seat of Peebles and Selkirk; he supported free trade, women's suffrage, national insurance, and curtailing the powers of the House of Lords, while opposing the welfare reforms of the Liberal Party, and what he considered the class hatred fostered by Liberal politicians such as David Lloyd George. With the outbreak of the First World War, Buchan went to write for the British War Propaganda Bureau and worked as a correspondent in France for The Times. He continued to write fiction, and in 1915 published his most famous work, The Thirty-Nine Steps, a spy-thriller set just prior to World War I. The novel featured Buchan's oft-used hero, Richard Hannay, whose character was based on Edmund Ironside, a friend of Buchan from his days in South Africa. A sequel, Greenmantle, came the following year. In June 1916 Buchan was sent out to the Western Front to be attached to the British Army's General Head Quarters Intelligence Section, to assist with drafting official communiques for the press. On arrival he received a field-commission as a second lieutenant in the Intelligence Corps. Recognised for his abilities, Buchan was appointed as the Director of Information in 1917, under Lord Beaverbrook—which Buchan said was "the toughest job I ever took on"—and also assisted Charles Masterman in publishing a monthly magazine detailing the history of the war, the first edition appearing in February 1915 (and later published in 24 volumes as Nelson's History of the War). It was difficult for him, given his close connections to many of Britain's military leaders, to be critical of the British Army's conduct during the conflict. Following the close of the war, Buchan turned his attention to writing on historical subjects, along with his usual thrillers and novels. By the mid-1920s, he was living in Elsfield and had become president of the Scottish Historical Society and a trustee of the National Library of Scotland, and he also maintained ties with various universities. Robert Graves, who lived in nearby Islip, mentioned his being recommended by Buchan for a lecturing position at the newly founded Cairo University. In a 1927 by-election, Buchan was elected as the Unionist Party Member of Parliament for the Combined Scottish Universities. Politically, he was of the Unionist-Nationalist tradition, believing in Scotland's promotion as a nation within the British Empire." The effects of the Great Depression in Scotland, and the subsequent high emigration from that country, also led him to reflect in the same speech: "We do not want to be like the Greeks, powerful and prosperous wherever we settle, but with a dead Greece behind us". He found himself profoundly affected by John Morley's Life of Gladstone, which Buchan read in the early months of the Second World War. He believed that Gladstone had taught people to combat materialism, complacency, and authoritarianism; Buchan later wrote to Herbert Fisher, Stair Gillon, and Gilbert Murray that he was "becoming a Gladstonian Liberal." After the United Free Church of Scotland joined in 1929 with the Church of Scotland, Buchan remained an active elder of St. Columba's Church in London, as well as of the Oxford Presbyterian church (now St Columba's United Reformed Church, Oxford). In 1933 and 1934 Buchan was further appointed as the King George V's Lord High Commissioner to the General Assembly of the Church of Scotland. Beginning in 1930 Buchan aligned himself with Zionism and the related Palestine All Party Parliamentary Group. (Despite this, Buchan was later described by Anthony Storr as being "overtly antisemitic", though he has been defended by others such as Roger Kimball, who stated that Buchan's anti-Semitism was merely representative of society at that time and that Buchan denounced Hitler's anti-Semitic policies in 1934.) In recognition of his contributions to literature and education, on 1 January 1932, Buchan was granted the personal gift of the sovereign of induction into the Order of the Companions of Honour. In 1935 Buchan's literary work was adapted for the cinema with the completion of Alfred Hitchcock's The 39 Steps, starring Robert Donat as Richard Hannay, though with Buchan's story much altered. This came in the same year that Buchan was honoured with appointment to the Order of St. Michael and St. George on 23 May, as well as being elevated to the peerage, when he was entitled by King George V as Baron Tweedsmuir, of Elsfield in the County of Oxford on 1 June. This had been done in preparation for Buchan's appointment as Canada's governor general; when consulted by Canadian prime minister R. B. Bennett about the appointment, the Leader of His Majesty's Loyal Opposition, William Lyon Mackenzie King, recommended that the King allow Buchan to serve as viceroy as a commoner, but George V insisted that he be represented by a peer. Buchan's name had been earlier put forward by Mackenzie King to George V as a candidate for the governor generalcy: Buchan and his wife had been guests of Mackenzie King's at his estate, Kingsmere, in 1924 and Mackenzie King, who at that time was prime minister, was impressed with Buchan, stating, "I know no man I would rather have as a friend, a beautiful, noble soul, kindly & generous in thought & word & act, informed as few men in this world have ever been, modest, humble, true, man after God's own heart." One evening in the following year, the Prime Minister mentioned to Governor General the Lord Byng of Vimy that Buchan would be a suitable successor to Byng, with which the Governor General agreed, the two being friends. Word of this reached the British Cabinet, and Buchan was approached, but he was reluctant to take the posting; Byng had been writing to Buchan about the constitutional dispute that took place in June 1926 and spoke disparagingly of Mackenzie King. On 27 March 1935, Sir George Halsey Perley announced in the Canadian Parliament (in place of the ailing Bennett, who had recommended Buchan for the governor generalship) that the King "has been graciously pleased to approve the appointment of Mr. John Buchan" as the viceregal representative. The King approved the appointment, made by commission under the royal sign-manual and signet. Buchan then departed for Canada and was sworn in as the country's governor general in a ceremony on 2 November 1935 in the salon rouge of the parliament buildings of Quebec. By the time Buchan arrived in Canada, William Lyon Mackenzie King had been sworn in as Prime Minister after the Liberal Party won the federal election held the previous month. Buchan was the first viceroy of Canada appointed since the enactment of the Statute of Westminster on 11 December 1931, and was thus the first to have been decided on solely by the monarch of Canada in his Canadian council. Buchan brought to the post a longstanding knowledge of Canada. He had written many appreciative words about the country as a journalist on The Spectator and had followed the actions of the Canadian forces in World War I when writing his Nelson History of the War, helped by talks with Julian Byng, before first visiting Canada in 1924. His knowledge and interest in increasing public awareness and accessibility to Canada's past resulted in Buchan being made the Champlain Society's second honorary president between 1938 and 1939. Buchan continued writing during his time as governor general, but he also took his position as viceroy seriously, and from the outset made it his goal to travel the length and breadth of Canada, including to the Arctic regions, to promote Canadian unity. He said of his job: "a Governor General is in a unique position for it is his duty to know the whole of Canada and all the various types of her people." Buchan also encouraged a distinct Canadian identity and national unity, despite the ongoing Great Depression and the difficulty it caused for the population. Not all Canadians shared Buchan's views; he aroused the ire of imperialists when he said in Montreal in 1937: "a Canadian's first loyalty is not to the British Commonwealth of Nations, but to Canada and Canada's King," a statement that the Montreal Gazette dubbed as "disloyal." Buchan maintained and recited his idea that ethnic groups "should retain their individuality and each make its contribution to the national character" and "the strongest nations are those that are made up of different racial elements." George V died in late January 1936, and his eldest son, the popular Prince Edward, succeeded to the throne as Edward VIII. Rideau Hall—the royal and viceroyal residence in Ottawa—was decked in black crepe and all formal entertaining was cancelled during the official period of mourning. As the year unfolded, it became evident that the new king planned to marry American divorcée Wallis Simpson, which caused much discontent throughout the Dominions. Buchan conveyed to Buckingham Palace and British Prime Minister Stanley Baldwin Canadians' deep affection for the King, but also the outrage to Canadian religious feelings, both Catholic and Protestant, that would occur if Edward married Simpson. By 11 December, King Edward had abdicated in favour of his younger brother, Prince Albert, Duke of York, who was thereafter known as George VI. In order for the line of succession for Canada to remain parallel to those of the other Dominions, Buchan, as Governor-in-Council, gave the government's consent to the British legislation formalising the abdication, and ratified this with finality when he granted Royal Assent to the Canadian Succession to the Throne Act in 1937. Upon receiving news from Mackenzie King of Edward's decision to abdicate, Tweedsmuir commented that, in his year in Canada as governor general, he had represented three kings. In May and June 1939, King George VI and Queen Elizabeth toured Canada from coast to coast and paid a state visit to the United States. Buchan had conceived the royal tour before the coronation in 1937; according to the official event historian, Gustave Lanctot, the idea "probably grew out of the knowledge that at his coming Coronation, George VI was to assume the additional title of King of Canada," and Buchan desired to demonstrate vividly Canada's status as an independent kingdom by allowing Canadians to see "their King performing royal functions, supported by his Canadian ministers." Buchan put great effort into securing a positive response to the invitation from the King in May 1937; after more than a year without a reply, in June 1938 Buchan headed to the United Kingdom for a personal holiday, but also to procure a decision on the possible royal tour. From his home near Oxford, Buchan wrote to Mackenzie King: "The important question for me is, of course, the King's visit to Canada." After a period of convalescence at Ruthin Castle, Buchan sailed back to Canada in October with a secured commitment that the royal couple would tour the country. Though he had been a significant contributor to the organisation of the trip, Buchan retired to Rideau Hall for the duration of the royal tour; he expressed the view that while the King of Canada was present, "I cease to exist as Viceroy, and retain only a shadowy legal existence as Governor-General in Council." In Canada itself, the royal couple took part in public events such as the opening of the Lions Gate Bridge in May 1939. The King appointed Tweedsmuir a Knight Grand Cross of the Royal Victorian Order while on the royal train, between Truro and Bedford, Nova Scotia. On 6 February 1940, he suffered a severe head injury when he fell after suffering a stroke at Rideau Hall. Two surgeries by Doctor Wilder Penfield of the Montreal Neurological Institute were insufficient to save him, and his death on 11 February drew a radio eulogy by Mackenzie King: "In the passing of His Excellency, the people of Canada have lost one of the greatest and most revered of their Governors General, and a friend who, from the day of his arrival in this country, dedicated his life to their service." The Governor General had formed a strong bond with his prime minister, even if it may have been built more on political admiration than friendship: Mackenzie King appreciated Buchan's "sterling rectitude and disinterested purpose." In his last years, Buchan wrote his autobiography Memory Hold-the-Door, as well as works on the history of Canada. He and Lady Tweedsmuir established the first proper library at Rideau Hall, and he founded the Governor General's Literary Awards which remain Canada's premier award for literature. His grandchildren James and Perdita Buchan also became writers. Buchan's 100 works include nearly 30 novels, seven collections of short stories, and biographies of Sir Walter Scott, Caesar Augustus, and Oliver Cromwell. He was awarded the 1928 James Tait Black Memorial Prize for his biography of the Marquess of Montrose, but the most famous of his books were the spy thrillers, and it is for these that he is now best remembered. The "last Buchan" (as Graham Greene entitled his appreciative review) was the 1941 novel Sick Heart River (American title: Mountain Meadow), in which a dying protagonist confronts the questions of the meaning of life in the Canadian wilderness. Tweedsmuir Provincial Park in British Columbia is now divided into Tweedsmuir South Provincial Park and Tweedsmuir North Provincial Park and Protected Area. It was created in 1938 to commemorate Buchan's 1937 visit to the Rainbow Range and other nearby areas by horseback and floatplane. He wrote in the foreword to a booklet published to commemorate his visit: "I have now travelled over most of Canada and have seen many wonderful things, but I have seen nothing more beautiful and more wonderful than the great park which British Columbia has done me the honour to call by my name". ^ a b "Queen's University Archives > Exhibits > John Buchan > Oxford, 1895–1899: Scholar Gypsy". Queen's University. Retrieved 30 March 2009. ^ a b Hillmer, Norman. "Biography > Governors General of Canada > Buchan, John, 1st Baron Tweedsmuir". In Marsh, James H. (ed.). The Canadian Encyclopedia. Toronto: Historica Foundation of Canada. Archived from the original on 3 July 2007. Retrieved 31 March 2009. ^ Lee, Sidney, ed. (1950). The Dictionary of National Biography. New York: Oxford University Press. p. 113. ^ "Queen's University Archives > Exhibits > John Buchan > Home and Family". Queen's University. Retrieved 30 March 2009. ^ a b c d e f Office of the Governor General of Canada. "Governor General > Former Governors General > Lord Tweedsmuir of Elsfield". Queen's Printer for Canada. Retrieved 14 April 2010. ^ "John Buchan Society > The Man". The Buchan Society. Retrieved 27 March 2009. ^ Parry, J. P. (2002). "From the Thirty-Nine Articles to the Thirty-Nine Steps: reflections on the thought of John Buchan". In Bentley, Michael (ed.). Public and Private Doctrine: Essays in British History presented to Maurice Cowling. Cambridge: Cambridge University Press. p. 226. ^ Charteris, John (1931) At G.H.Q., Cassell. ^ "Queen's University Archives > Exhibits > John Buchan > World War 1: The Department of Information". Queen's University. Archived from the original on 5 December 2008. Retrieved 30 March 2009. ^ Sanders, M. L. (1975). Culbert, David (ed.). "Wellington House and British Propaganda During the First World War". The Historical Journal (18). London: Carfax Publishing. pp. 119–146. ISSN 0143-9685. ^ "Debate on the Address". Parliamentary Debates (Hansard). House of Commons. 24 November 1932. col. 261. ^ "Debate on the Address". Parliamentary Debates (Hansard). House of Commons. 24 November 1932. col. 267. ^ Christopher Hitchens (March 2004). "Between Kipling and Fleming stands John Buchan, the father of the modern spy thriller". The Atlanic. Retrieved 13 August 2014. ^ Defries, Harry (2001). Conservative Party Attitudes to Jews, 1900–1950. London: Routledge. p. 148. ISBN 0-7146-5221-0. ^ Anthony Storr (1997). Feet of Clay: A Study of Gurus. HarperCollins. p. 168. ^ Roger Kimball. "Catching up with John Buchan". The Fortnightly Review. Retrieved 13 August 2014. ^ "No. 33785". The London Gazette. 29 December 1931. p. 12. ^ "No. 34164". The London Gazette. 28 May 1935. p. 3443. ^ "No. 34167". The London Gazette. 4 June 1935. p. 3620. ^ Reynolds, Louise (2005). Mackenzie King: Friends & Lovers. Victoria: Trafford Publishing. p. 124. ISBN 978-1-4120-5985-5. ^ House of Commons (Canada) Debates, March 27, 1935, page 2144. ^ House of Commons (Canada) Debates, March 27, 1935, page 2144. Cited with other details in Galbraith, J. William, "John Buchan: Model Governor General", Dundurn, Toronto, 2013. p.19. ^ Smith, Janet Adam (1979). John Buchan and his world. Thames & Hudson. p. 89. ISBN 0-500-13067-1. ^ The Champlain Society. "Former Officer's of The Champlain Society (1905–2012)". Archived from the original on 27 October 2014. Retrieved 19 October 2014. ^ The first governor-general to travel to the Canadian Arctic was Lord Byng (GG 1921-1926) in 1925. Cited in Galbraith, William, "The Literary Governor-General" in "The Literary Review of Canada", October 1996, page 19. ^ Smith, Janet Adam (1965). John Buchan: a Biography. Boston: Little Brown and Company. p. 423. ^ "Royal Visit". Time. New York: Time Inc. IXX (17). 21 October 1957. ISSN 0040-781X. Retrieved 29 March 2009. ^ Saunders, Doug (27 June 2009). "Canada's mistaken identity". The Globe and Mail. Retrieved 28 June 2009. ^ Hubbard, R.H. (1977). Rideau Hall. Montreal and London: McGill-Queen's University Press. p. 187. ISBN 978-0-7735-0310-6. ^ Tony O'Donohue v. Her Majesty the Queen in Right of Canada and Her Majesty the Queen in Right of the United Kingdom , 01-CV-217147CM, s. 34 (Ontario Superior Court of Justice 26 June 2006). ^ Library and Archives Canada (2007). "The Diaries of William Lyon Mackenzie King". Queen's Printer for Canada. p. 562. Archived from the original on 12 June 2013. Retrieved 14 August 2012. ^ a b c d Galbraith, William (1989). "Fiftieth Anniversary of the 1939 Royal Visit". Canadian Parliamentary Review. Ottawa: Commonwealth Parliamentary Association. 12 (3). Retrieved 29 March 2009. ^ Montrose – A History was a scholarly revision of The Marquis of Montrose, published in 1913. ^ Ministry of the Environment. "BC Parks > Find a Park > Tweedsmuir South Provincial Park > History". Queen's Printer for British Columbia. Retrieved 27 May 2009. ^ a b c d e "Material relating to John Buchan, first Lord Tweedsmuir (1875–1940)" (PDF). National Library of Scotland. ACC 12329. Retrieved 29 March 2009. ^ a b Honorary Degree Recipients 1850 – 2008 (PDF). Toronto: University of Toronto. 30 June 2008. p. 8. ^ "Canadian Mountain Encyclopedia > Tweedsmuir Peak". Mountain Equipment Co-op. Retrieved 27 May 2009. ^ "Find a Walk > The John Buchan Way (Peebles to Broughton)". Walking Scotland. Retrieved 26 March 2009. ^ "John Buchan Centre". John Buchan Society. Retrieved 26 March 2009. Wikimedia Commons has media related to John Buchan.